Pictured are Rep. Matt Dowling and Lee Edgell, who was the division two, third-place winner of the School Bus Safety Poster Contest. 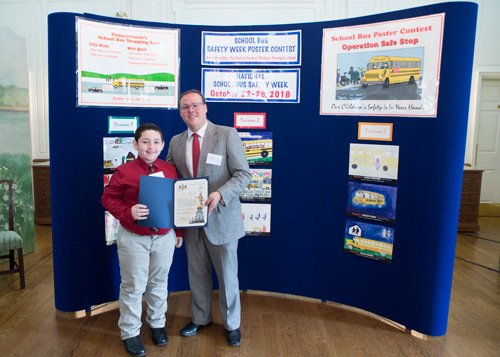 HARRISBURG – Rep. Matt Dowling (R-Fayette/Somerset) today congratulated Lee Edgell, who won third place in division two of this year’s School Bus Safety Poster Contest, as the student received his award at a ceremony held at the Governor’s Residence in Harrisburg. Edgell attends Friendship Hill Elementary School in Port Marion. 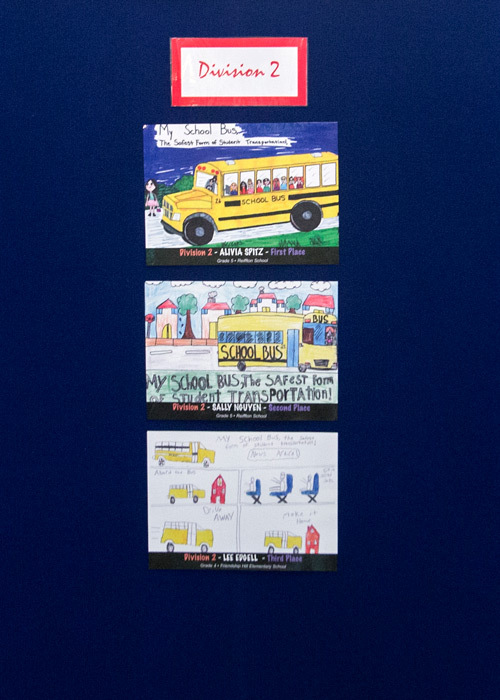 School districts across the state and throughout the country are observing National School Bus Safety Week from Oct. 22-26, and in conjunction with National School Bus Safety Week, the Pennsylvania Department of Transportation coordinates the School Bus Safety Poster Contest for the Commonwealth. Lee Edgell’s poster can be seen in this photo at the very bottom. This year, PennDOT received 352 entries from across the state. The nine children who submitted this year’s winning posters were notified of their accomplishments and attended an awards ceremony at the Governor’s Residence Monday, Oct. 22, at 10 a.m. These children were accompanied by their families and school officials and their winning entries were displayed at the event.